Despite being less than 20 miles from my apartment, it took me nearly 45 minutes to get to the trailhead due to the rough condition of the Forest Road that provides access. After some quick stretching and last-minute gear checks I hit the trail in the early afternoon at what, for me, was brisk pace. Although I’ve hiked sections of the Camas Creek Trail before and found it to be a pleasant piece of trail, it was even more scenic with the changing colors of the foliage in the background. The fragrance of the forest seemed magnified and the temperature was a perfect balance of crisp fall air mixed with warm sunshine and a light breeze that was absolutely sublime for hiking. 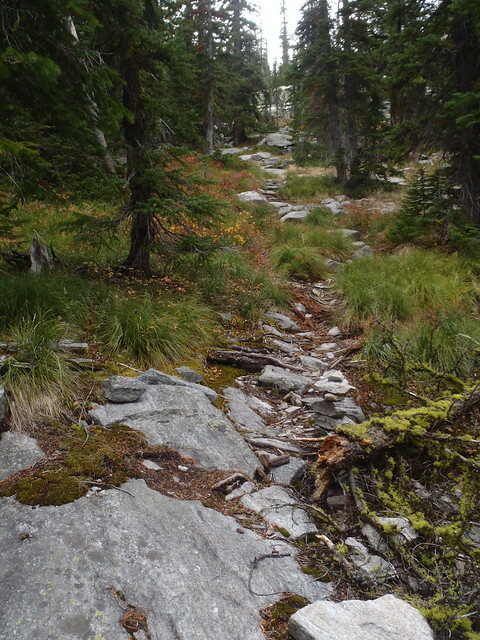 The trail is fairly short and of only moderate difficulty (about 3 mile to Camas Lake, with 1,200 feet of elevation gain) but it has a nice flow to it and changes scenery enough to keep it interesting. 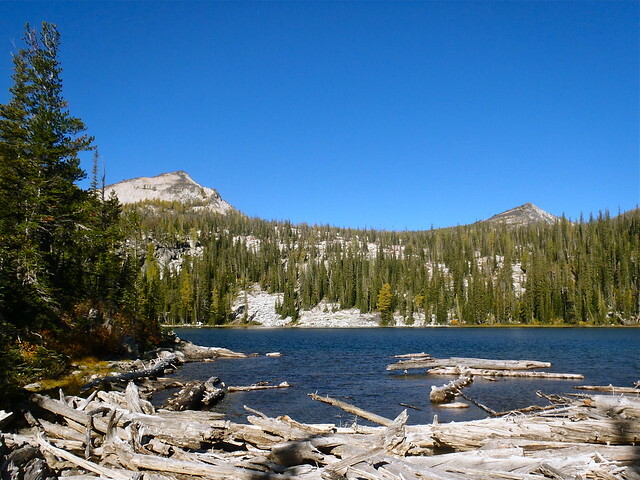 I took a short break at Camas Lake, arriving there after a bit more than an hour of hiking, before skirting the lakeshore and continuing towards Upper Camas Lake. 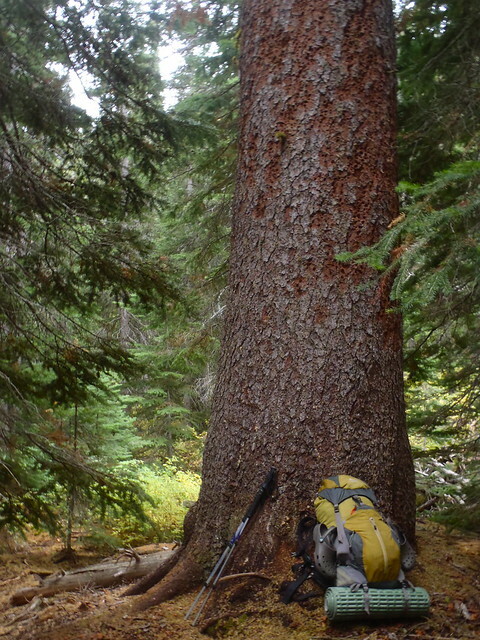 I had a few routefinding issues on my way up to the lake and one “detour” led me past a rather large tree that warranted a few moments of appreciation. 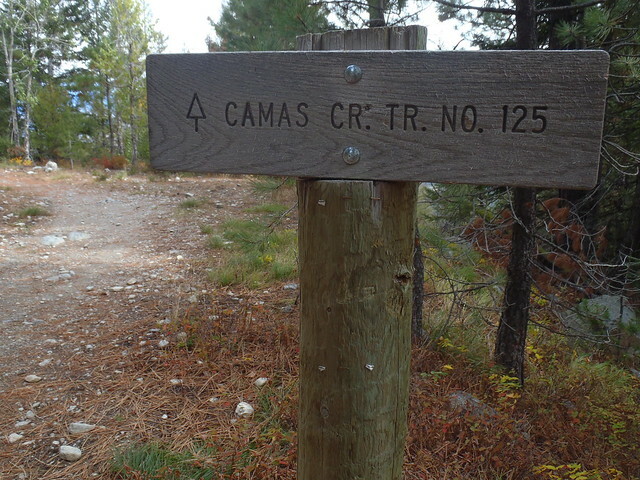 It was only a mile, with about 600 feet of elevation gain, to Upper Camas Lake but it took me nearly an hour to get there. 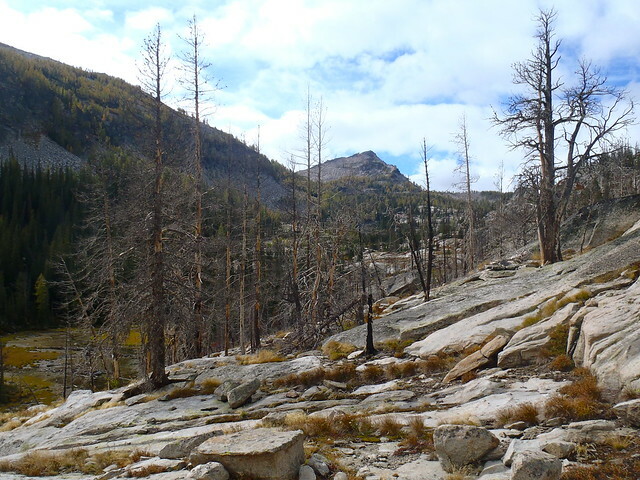 Some of this could be attributed to the frequent breaks I took to soak up the scenery, but the terrain and intermittent trail — especially easy to lose when it crosses the large granite slabs — make it ill-suited for trying to maintain an above-average pace. Upper Camas Lake was just as breathtaking as it was the previous weekend and the knowledge that I would be able to spend the night there made reaching the lake even more pleasurable. 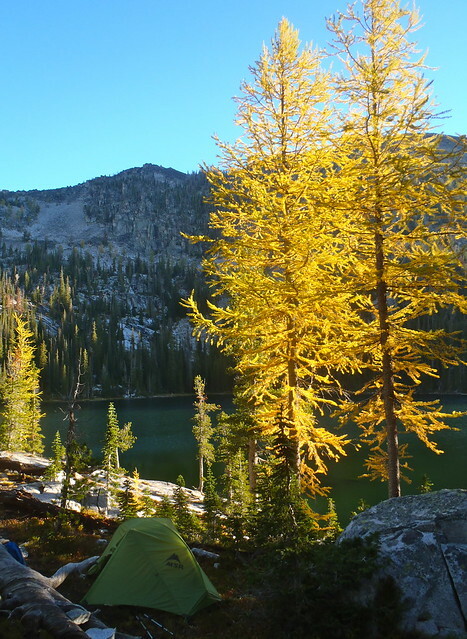 I followed the lakeshore to what my instincts told me would be a great campsite and, sure enough, I found a great spot to set up my tent under two gorgeous and golden larch trees. A short walk lead me down to a rock outcropping at the lakeshore that provided easy access to water and an incredible vantage point across the lake and up to the two peaks that flank the western reaches of the Camas cirque. Behind the campsite was a fire ring with some stacked nearby; giving credit to the person behind the creation of the fire ring, I was relieved to see that the fire ring was not situated in a spot that would be suitable for a tent and was over 200 feet from the lakeshore. It’s always a bit frustrating to be looking for a tent spot and see a perfectly good one covered up by a fire ring. After setting up camp and filtering water (although technically I used iodine tablets since my water filter had been sent back to MSR for repair) I circumnavigated the lake to keep my muscles loose, enjoy the spectacular lighting from as many angles as possible, and see if there were any other attractive spots for camping. 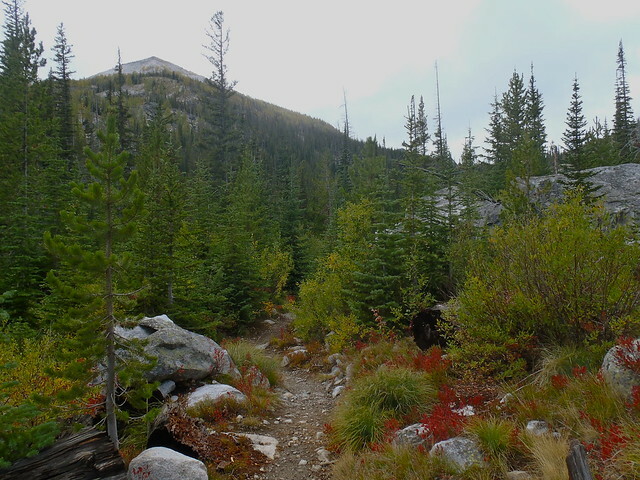 The walk around the lake was thoroughly enjoyable and didn’t reveal any other options for camping that were significantly better than the spot where I’d set up, which was good information to know for future trips to the lake. It was a good feeling to get it right on the first try. I stretched for a while after my walk, enjoyed some tea, and then began to make dinner. The winds has picked up late in the afternoon and I had to creatively arrange my backpack and some rocks to keep my stove out of the wind. I also discovered that my iPod would pick up the local NPR station, which was excitedly marked down in the “pluses” list I was mentally making for the campsite. I enjoyed an episode of Radiolab while making and consuming my dinner as twilight settled across the landscape. Since it was too cloudy for stargazing, I decided to indulge myself with a campfire. 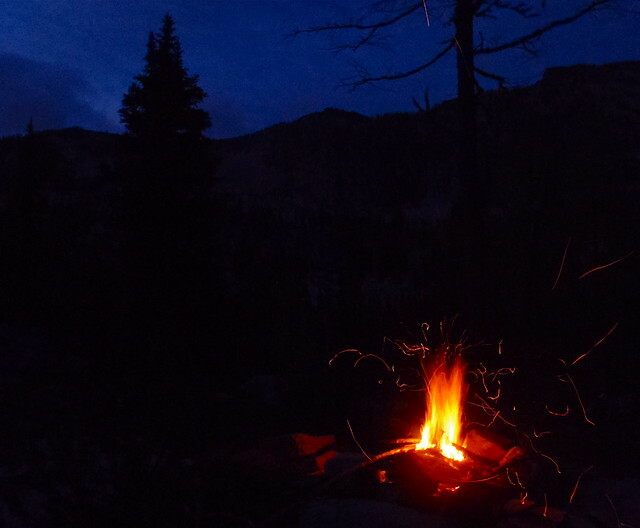 I rarely build fires, but given the existing campfire ring and the already-gathered firewood I decided I might as well enjoy an hour or two of warmth and light before settling into my sleeping bag. I awoke a bit after first light the next morning; it was crisp but not cold enough to freeze the water in my bottle. 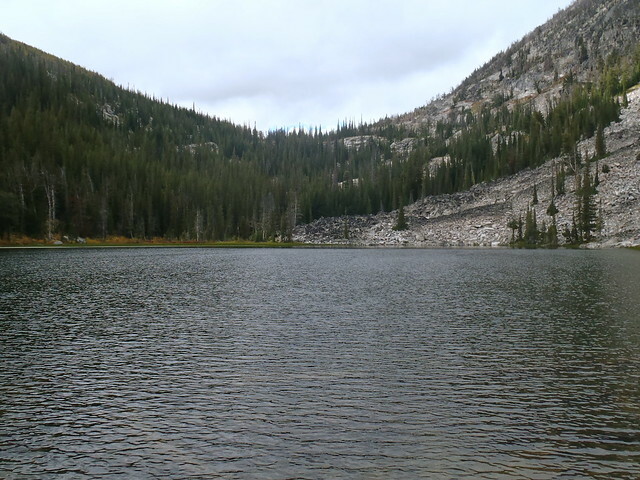 I had considered hiking up to one of the peaks before packing up, but decided that in the interest of time and energy a quick jump in the lake would be enough adventure for me. So after some oatmeal and coffee and packing up my gear, I made a cup of green tea and then took the plunge. Sitting in the sunshine and sipping warm tea while drying off from a jump in a frigid mountain lake is not a pleasure I enjoy every morning, so I savored the experience before putting on my boots and heading down to the trailhead. 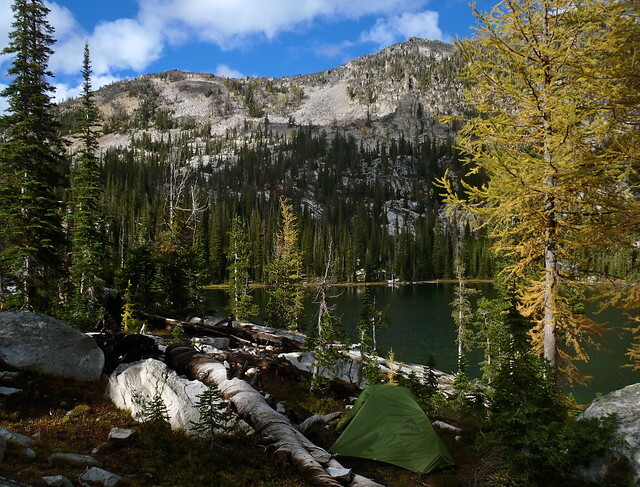 I’ll definitely making more trips to Upper Camas Lake; between ease of access and the multiple options for summiting the various peaks and high points in the Camas cirque it seems to have all the ingredients as a great “default” trip when I’m short on time but wanting to fit in a night or two of backpacking.